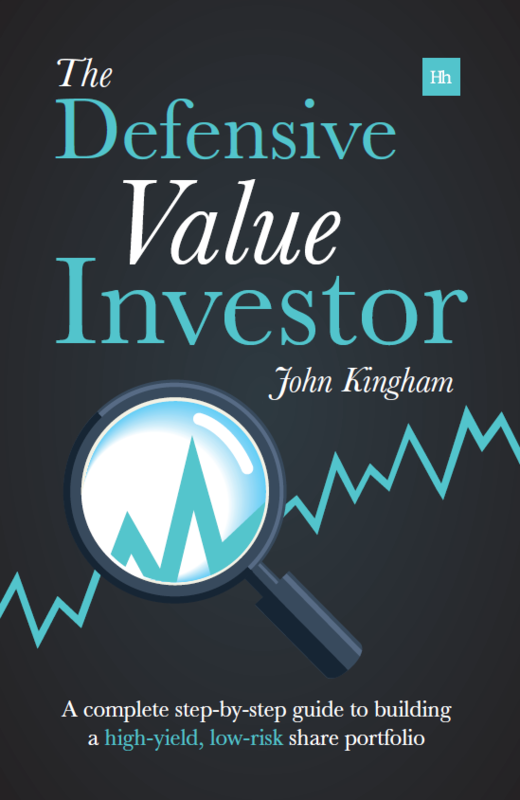 The UKVI Defensive Value Model Portfolio celebrated its third birthday at the start of March, so this quarterly update is the first chance I’ve had to review its performance over such a long time frame. After three years of effort, has it all been worth it? Low Risk – I mention risk first because everybody gets so excited about returns that they forget about risk, until it’s too late. Low risk means low “beta”, although I’m gradually leaning towards using peak-to-trough drawdowns instead. 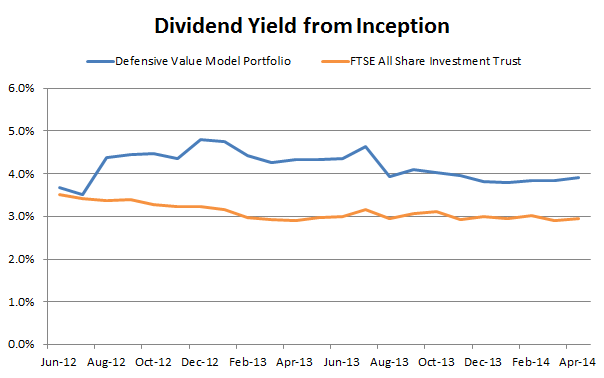 High Yield – The portfolio should always have a higher yield than the FTSE All-Share. The Investment Management Association (IMA) defines the Equity Income category as requiring a historic yield at least 110% of the All-Share’s, so I’ll go with that definition too. High Growth – I expect the portfolio’s total return to be around 3% a year higher than the FTSE All-Share’s when measured over periods of 5 year or more. The 3% a year figure is based on my expectation of getting 1% additional returns from buying high yield shares, 1% from buying growing companies and 1% from buying low and selling high. Low Maintenance – The portfolio should only take a day or two each month to manage, i.e. between 8 and 16 hours depending on events (and assuming you have access to a stock screen which can do most of the leg-work for you). The model portfolio is currently valued at £71,560 compared to £65,879 for its benchmark (a FTSE All-Share tracking investment trust), £60,165 for the “average” investor and £55,066 for the “bad” investor. Just in case you’re wondering who this “average” and “bad” investor are, they underperform by 3% and 6% a year respectively, taken from research by Barclays and Pete Comley’s book, Monkey with a Pin (respectively again). They represent returns to the typical active, private investor. 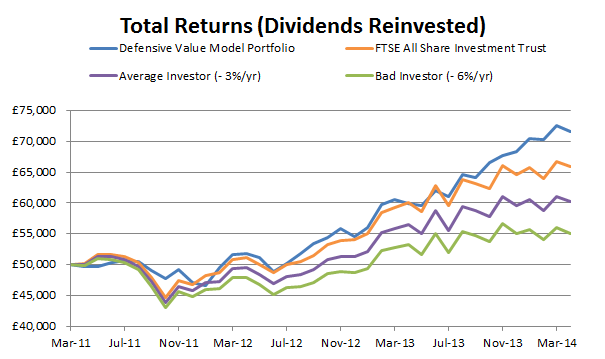 The total return over the last year has been 19.6% for the model portfolio and 9.6% for the All-Share. Over 3 years that changes to 43.1% for the model portfolio and 31.8% for the All-Share. In annualised terms the model portfolio is just about dead on its 3% a year outperformance target, with an annualised rate of return of 12.3% compared to 9.4% for the All-Share. So by just looking at the total return figure everything looks like it’s going to plan so far. But total return and share prices are a pretty limited way to view investments, so let’s broaden out a bit. Since the portfolio started in March 2011 its total value has of course fluctuated up and down. That’s no surprise as capital volatility is one of the basic features of the stock market. This capital volatility is an easy – although far from perfect – way to measure risk. One way to measure risk through capital volatility is to look at how far a portfolio falls in value from its peak. A portfolio which falls 50% when the general market only falls 10% could reasonably be called “high risk”. 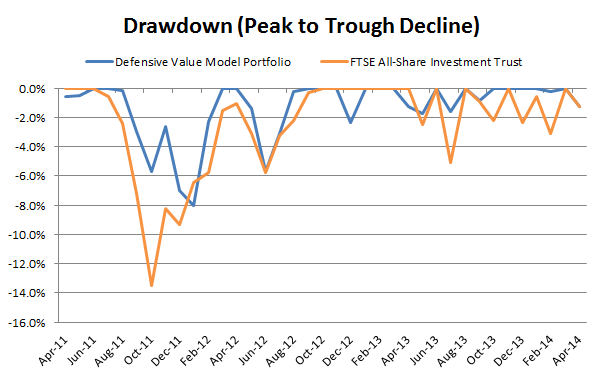 So how does the UKVI model portfolio measure up on drawdown risk? The chart above shows you how far the model portfolio and the All-Share fell from peak-to-trough in any given month. So for example in July 2013 the All-Share was 5.1% below its peak. Drawdown is a sensible measure of risk as it measures what most investors actually care about, i.e. how much a portfolio “loses” relative to its previous value. As you can see the model portfolio has generally had fewer and smaller drawdowns than the market. The striking difference in October 2011 is a little unfair; the model portfolio at that time wasn’t fully invested and still had around 23% in cash, hence its smaller maximum drawdown of 8% compared to the All-Share’s decline of 13.5%. But in 2012 and 2013 the portfolio was fully invested in shares and, especially in 2013, it has clearly had fewer and smaller “losing” months than the All-Share. Defensive companies – The portfolio consists of 30 companies, each of which has paid a dividend over the past decade and most of which have grown more consistently and faster than the average company. Because these companies are strong and stable they have fewer problems than average, and when they do have problems the market typically has more faith that the company can recover; both of which lead to smaller drawdowns. Wide diversification – 30 companies is more than enough to capture almost all of the benefits of investing in multiple companies, but more than just holding lots of companies, the portfolio is deliberately diversified both geographically (less than 50% of revenues are generated within the UK) and industrially (no more than 3 companies are in any one sector). On those grounds I think the model portfolio has achieved its Low Risk goal so far, although the real test will be when we see our next big bear market, whenever that may be. 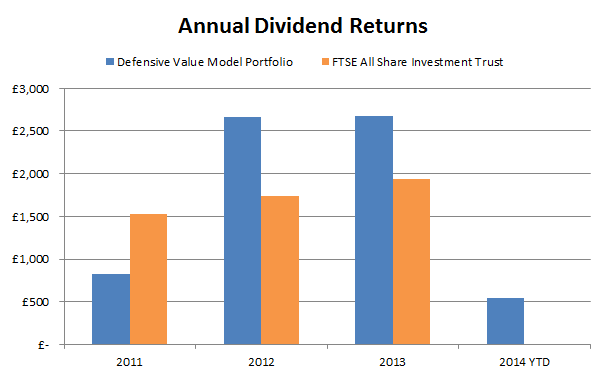 By dividends I mean normal dividends, not cash returns from the sale of capital assets (e.g. the shares and cash paid out to the portfolio by Vodafone after its recent sale of Verizon) or cash from the sale of rights not taken up in a rights issue (e.g. RSA, where the rights from its recent rights issue were sold for cash which has been reinvested in the portfolio). In percentage terms the dividend yield has been around 130% of the All-Share’s yield, which is well above the level to be considered “equity income” by the IMA. So what do those dividends look like on an annual basis in cash terms? 2011 was a lean year for dividends in the model portfolio, partly because it wasn’t fully invested but mostly because it takes time for dividends to start flowing from newly bought shares. However, 2012 and 2013 have produced significantly more cash income than the broad UK market. The income has been fairly reliable too, although it’s too early to say too much about that, and a deep bear market will be a good test of dividend robustness. Another goal of the portfolio is to be “easy” to run, i.e. both low stress and low effort. The low stress aspect comes from holding 30 companies, most of which make up just 3% or so of the whole portfolio. If one of them falls by 20% then the portfolio takes a hit of just 0.6%, which is nothing to get too upset about. This is more important than you might think because it is a key defence against poor decision making. Far too many investors have upwards of 10% of their money in a single company (often the one they work for) and when things go bad the impact is significant, both financially and psychologically. This leads to a knee-jerk reaction – usually to sell at precisely the wrong time. Holding small positions in more companies is the easiest way to reduce stress and the financial loss it can cause, without having to move to lower risk, lower return assets like cash or bonds. As for effort, even with 30 companies there isn’t all that much to do. In January – Aviva was sold, which produced an annualised rate of return of 18% over a somewhat rocky 2 years. In February – A FTSE 100 consumer goods company was added to the portfolio. It’s a company which had previously been sold at a higher price, but its focus on emerging markets and the decline in sentiment there produced an opportunity to buy the company back again at a lower price. In March – Another FTSE 100 company joined the portfolio, this time from the oil services industry. Its steady and rapid growth combined with a decent dividend yield made it a worthy new investment. In April – Mears was sold, producing gains of more than 25% a year over a happy 3 year period. As you can see, while the model portfolio is an active portfolio, it doesn’t involve frantic buying and selling. Just one trade, once a month is all it requires (plus a bit of time reviewing annual and interim results as they come out). So three years in and I’m happy with the way things have gone so far, and it will be interesting to see how the portfolio and the underlying investment strategy hold up against whatever the market has to offer over the next three years and more. 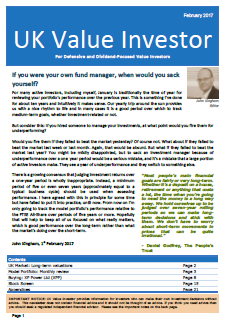 If you’d like to know a bit more about the investment strategy that underpins this portfolio (i.e. the horse, and the horse is more important than the jockey), there are guides and worksheets available. Good work, and wonderfully clear explanation. I think it’s good how you point out the caveats, too (such as the cash in 2011). I do think it’s been a good few years to be an income investor, albeit a little choppier in the past 10 months or so. To my mind the real test won’t be so much a bear market, but how you do afterwards. i.e. How will you perform “over the cycle” as Buffett now puts it in his letter for Berkshire Hathaway. It looks like you’ll do fine, but it’ll be good to see. I think the other point I’d raise is on dividend reinvestment. Clearly that’s helped your total return, versus the FTSE, although probably not enough to be a decisive factor yet. Still, a capital only section could be an interesting extra section if it’s feasible to compute it. Firstly, some people will likely be using such a portfolio to draw income, so it’s useful data. Secondly, over the long-term it will probably demonstrate the power of dividend reinvesting. Thanks M, hopefully I’ve got the idea across that focusing just on “share price” or total value is a bad idea. As for an “income” rather than “accumulation” portfolio, I did have one set up but with a £50,000 starting capital value like the accumulation one in the article above. However, I’ve decided that’s too small for an income portfolio so I’m going to re-do it (using all the same buy and sell decisions and prices as for the portfolio above) but with a £500,000 starting value. At £500k it should yield an income of perhaps £15-20k purely from dividends, growing at perhaps 2-5% above inflation, which seems more realistic to me. If £500k sounds like a lot then I hope that the accumulation portfolio, starting at £50k, can get there in about 15-25 years (i.e. within an investment lifetime), assuming the nominal rate of return is somewhere between 10-15%. I’ll run the income portfolio alongside the accumulation one and draw a progressive dividend like the big income investment trusts by leaving a small float of cash in the fund to keep dividends up in down years.